Assault Android Cactus is a twin-stick shooter game that was developed and published by Witch Beam. It was published in August 2015 on Steam. It also got published on PlayStation 4 in March 2016. It has also gone a long way since it started development since 2013, and it used to be a simple twin-stick shooter game. However, they refined the gameplay elements and added more content. 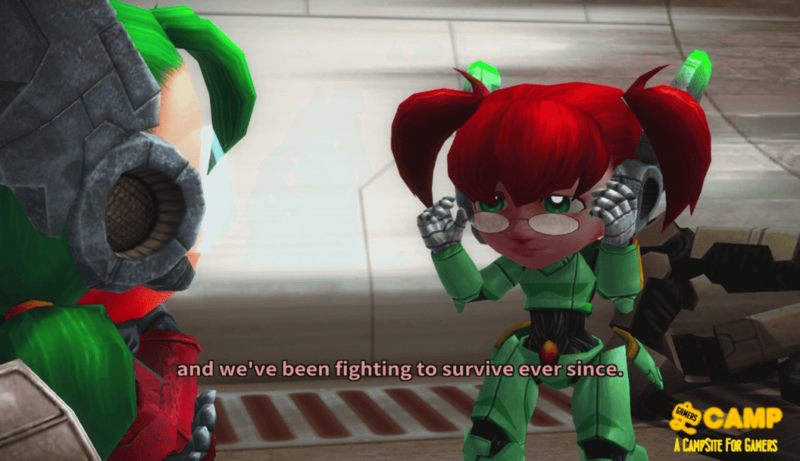 The story of Assault Android Cactus is probably the weakest point of the game. Although, it is decent for an indie game. You fight rogue robots that turned against the humans and androids, very similar to I, Robot movie by Alex Poryas. It is not really that fleshed out though, and the campaign is around 2 to 3 hours long, not included the grinding to get the EX features of the game. This is simply an arcade game with a little story. I do like that each android has different dialogues for each boss battles. This makes you want to try to finish the game with each android. Cutscenes are very few, though, and I wish they could have added a lot more especially after each stage. Sadly, they did not do it. The graphics look amazing in my honest opinion. I love the vibrant and colorful look of the game. The user interface is not even annoying in this game. The details of the level are very well-made, and they never look dull. The androids and bosses look unique and distinguishable. They are pretty memorable. The level design is also amazing although very linear. Some might say it is a bit cramped for a fast-paced game, but I think it is already perfect. The animation is fluid and smooth; it feels like everything is tightly connected. Assault Android Cactus is very fun and exciting to play. One button is for normal attack, and the other is for their special attack. It is really simple, and some may find it really repetitive. I do find it thrilling because there are several enemies trying to zerg-rush you most of the time. Good thing is, the controls are really crisp, so you can easily maneuver around the map. There are also power-ups in the game that can give you an advantage in the game. Sadly, there are only a few available power-ups in his game. You can also play co-op, and the maximum couch players are four. I believe that you can maximize the fun out of this game if you play with friends. I did play with my cousin and we had a ton of fun. You can choose to nine androids, which 5 of those are unlockable in each section. Each has a different primary and special attacks. Some are obviously cheesier to use than the others leading to the usage rates of a few androids being higher than some. The ambiance and soundtrack in the game is overall above average, it is really polished and it helps you to get more hyped especially when there are a lot of things happening on the screen. Also, props to Jeff van Dyck for composing the amazing soundtrack for this game. The voice acting is decent, but since the cutscenes are few, you do not really hear them that much. I mentioned earlier that the main campaign is short. However, you can fight the boss again with different characters to see the different dialogues prepared for a boss battle. It is really a nice detail in this Assault Android Cactus. There are other modes too such as Infinity Drive, Daily Drive, Boss rush, etc. These are fun modes but you may get bored easily since they are mostly the same. Assault Android Cactus also has EX Options, these are experimental modes which you can activate. Some unlockables are being able to play in first person mode or have co-op AI. These really add something new to the game and it is fun for quite a while. You have to buy these experimental features and it means you have to grind for credits. It kind of takes a while before you could buy all of them. Assault Android Cactus is worthy of its $14.99 price. The developers, Witch Beam, developed a very fun and amazing game. The story may not be interesting, but that is not why you buy this type of game, right? It is because of its gameplay. It delivers its gameplay with crisp control, fluid animation, great soundtrack, and well-detailed graphics.